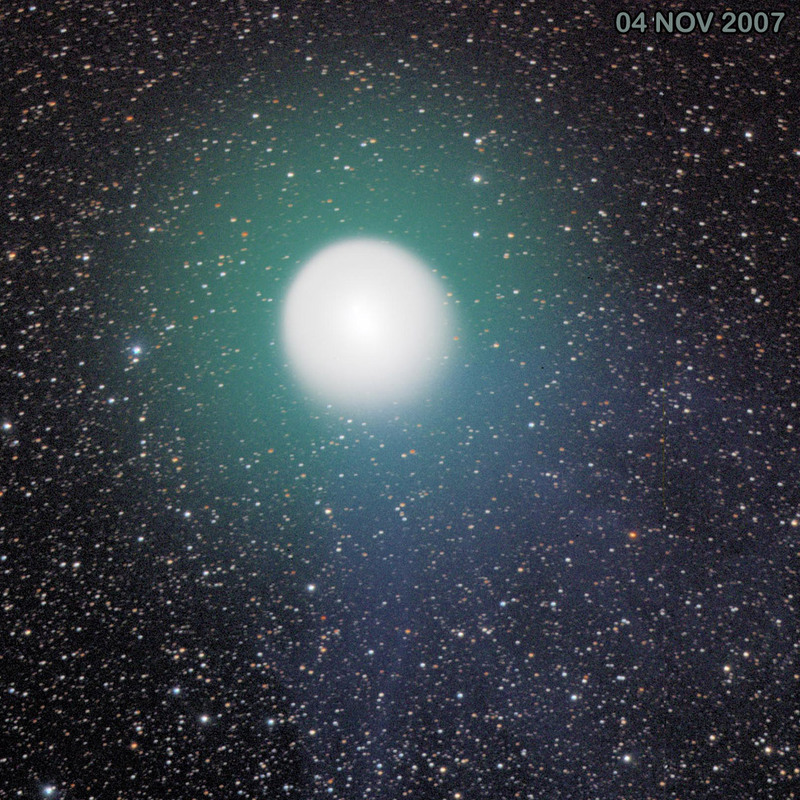 It was ten years ago that comet Comet Holmes (17P/Holmes) livened up the fall and winter skies with a sudden outburst that brightened it from mag. 17 to above naked-eye mag. 2.8 on October 23/24, 2007. Its coma subsequently expanded to a diameter greater than that of the sun! 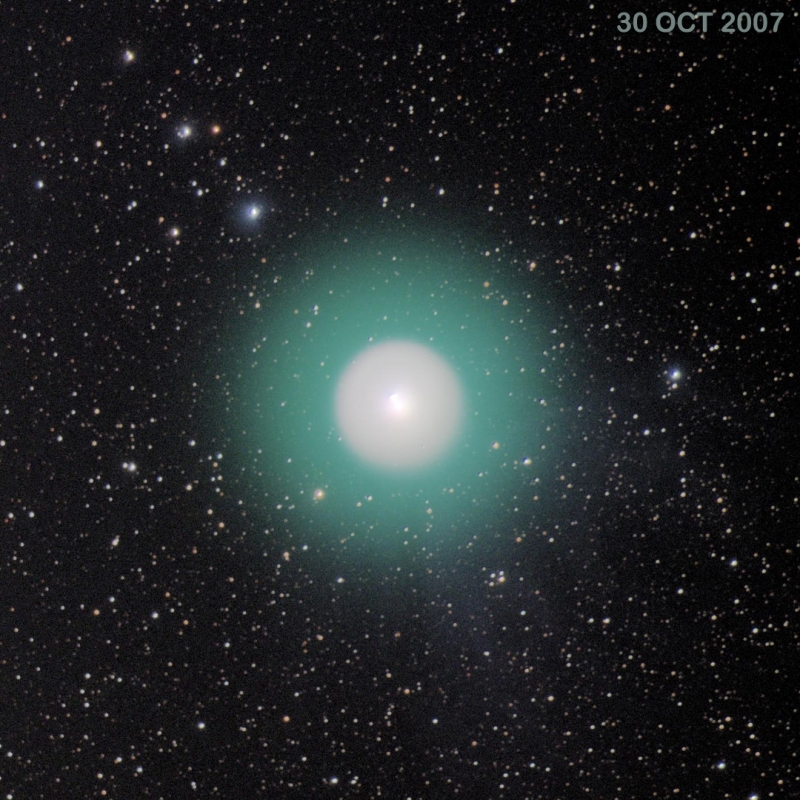 Well placed in Perseus for northern hemisphere observers, it became an instant imaging target for amateur astronomers. Images often show it as a “ball’ because it was positioned such that from Earth, observers were looking straight down along the tail. 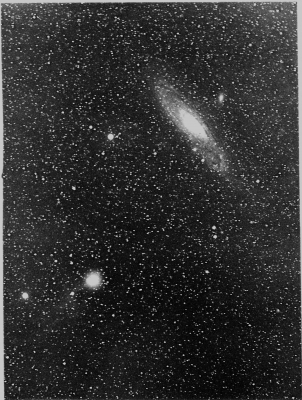 Comet 17P/Holmes is the bright object at lower-left near M31 on November 10, 1892. From Publications of the Lick Obs. 11 (1913) Plate 102: Photographed by Edward Barnard with the wide-field 6-inch Willard portrait lens at Lick Observatory. 3-hr exposure. Holmes’ outburst are nothing new. Edwin Holmes discovered the comet near the Andromeda Galaxy (M31), in 1892, from his location outside of London. An outburst has turned it into a readily-visible naked-eye object. A second outburst occurred in mid-January. After the next two appearances in 1899 and 1906, the comet was not observed for the next seven appearances until it was recovered in 1964. It has been sighted on each return since. With an orbit of only 6.9-years, it received the official designation “17P” for being the 17th confirmed periodic comet. Over the years of observations, eight magnitude outbursts have been recorded for the comet. The most recent was in 2015. 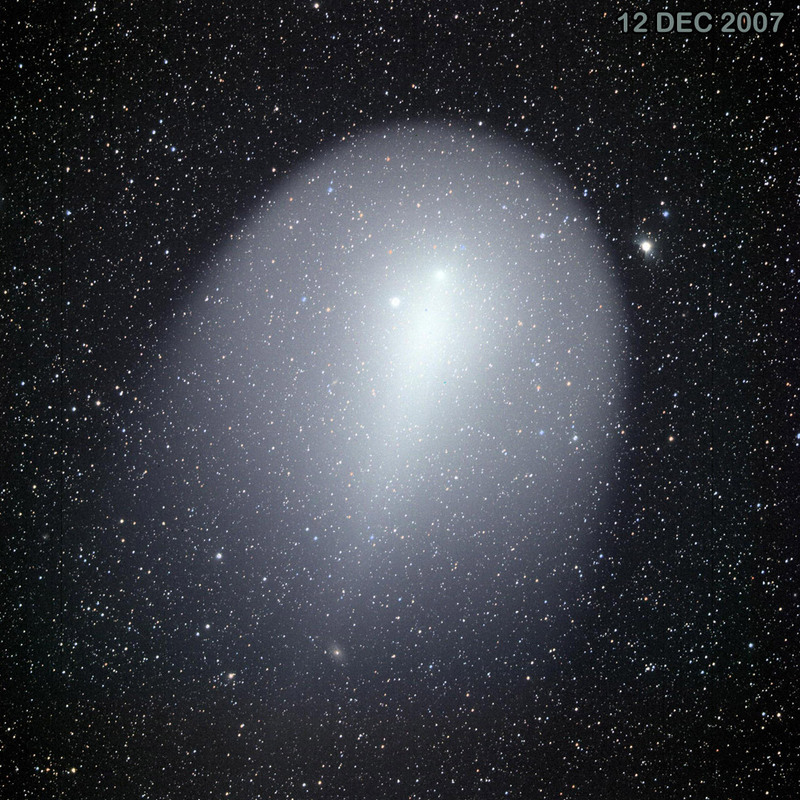 Simulated comet Holmes position and size from late October to late December 2007. Adopted from Public Domain image on Wikipedia Commons. Noted amateur astronomer James Burnell (co-author with Richard Berry of the Handbook of Astronomical Image Processing and AIP4WIN image processing software) imaged this “icy snowball” with the Tele Vue-NP127is telescope and SBIG STL11000M camera. Jim’s images below show the evolution of the comet’s coma after the outburst. 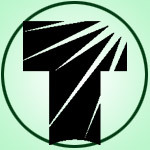 Images were cropped from the full frame. October 30, 2007 (mag. ~2.5): “With the exception of the color, it closely resembles what I saw in the eyepiece while I observed it earlier that night. Too bad the beautiful blue color was too faint to see”, says Jim. LRGB: 16x20s:16x20s:16x20s:16x20s and aligned on the background stars. November 4, 2007 (mag. ~2.7): Jim tells us that the “image has been strongly gamma-stretched to show the details in the comet’s tail.” LRGB: 8x1m:4x1m:4x1m:4x1m and aligned on the nucleus. Comet Holmes swung around our sun again with a perihelion on March 27, 2014. It will next be in closest proximity to the sun on February 19, 2021. Tele Vue-NP127is: 127mm aperture, f/5.2, flat-field APO (Nagler-Petzval) Refractor. Photometry magnitude observations of Comet 17P from 1986 onward published in the International Comet Quarterly. Previous Previous post: Tele Vue Holiday Sale!